You probably don’t know that any data you have typed at web browser including your private information like bank account, password and credit card number may be monitored by cyber criminal who we called as Keyloggers. Keyloggers will observe and record as you move your keystrokes along that may be misused by any intruders without your notice. We used to have anti-virus and anti-spyware programs installed on computer but unfortunately they are ineffective in dealing with this attack. The only method to solve this issue is to have an anti-keylogging program installed at the first place. Known as KeyScrambler v2.4.1.1, it will able to protect every single character you have typed into your browser from being stolen by Keyloggers. 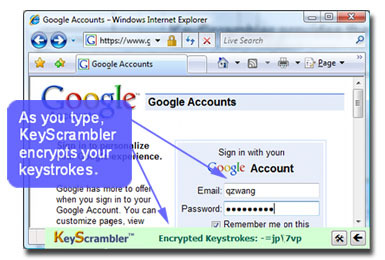 KeyScrambler is a add-on browser that can be very reliable and easy to use. It help to protect anything you have typed on web browser by encrypting your keystrokes at the keyboard driver level in the kernel, it then decrypts the keystrokes at the application interface so that you can see exactly the same content as you have typed. By having KeyScrambler installed in your computer, Keylogger has no way to steal your data anymore as all those it got is only the encrypted junk data. Unlike other traditional anti-virus programs, it doesn’t require you to upgrade from time to time but still can be used effectively to defeat old and new, known and unknown keyloggers. Another great feature that worth to highlight here is in order to let you have better picture of what has been encrypted by KeyScrambler, it will show you the live encryption while you are typing, so that you are more convinced with how it works with proper encryption as you type in. KeyScrambler Personal 2.4.1.1 is absolutely free to download and it only support IE (version 6 or 7), Firefox (version 1.5 and above) and Flock (version 1.0 and above) browser. The pre-requisite to install KeyScrambler is your computer must have Windows 2000/2003/XP/Vista (32-bit and 64-bit) and Internet connection. You are required to restart computer in order to complete the whole installation process. Once KeyScrambler is installed, you will notice the small Overlay Window appear at the top left corner by default to display the encrypted key which you have typed in the web browser. You may refer to User Manual and Tutorial for more details of how it works.